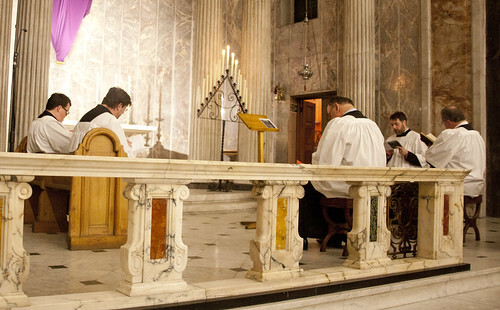 This Holy Week in the heart of London, a rare opportunity to experience one of the oldest services in the Catholic Church along with a feast of chant and polyphony including a Sacred Music World Premiere. Since his appointment as Director of Music, Matthew Schellhorn has involved more professional musicians, both singers, organists and composers, in the work of the Latin Mass Society. In October 2018, Cantus Magnus gave the World Premiere of new commissions Missa Rex in Æternum and Ego mater along with UK Premieres of several other works by American composer Peter Kwasniewski (b. 1971). The Latin Mass Society is pleased to announce that the renowned composer and theologian Peter Kwasniewski has been commissioned to write for Cantus Magnus, and his Lamentations of Jeremiah will be sung at the daily Tenebrae during the Sacred Triduum. This new work, structured in three parts for each day, will allow the entire liturgical text to be sung by incorporating the original chant for the Lamentation narrative, preceded by polyphonic introductions and concluding with a haunting meditation on the text, ‘Jerusalem, Jerusalem, convertere ad Dominum Deum tuum’ (‘Jerusalem, Jerusalem, return unto the Lord thy God’). 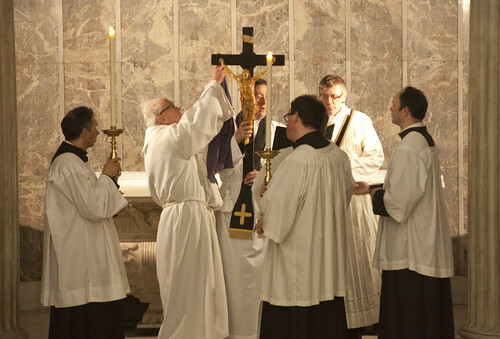 The Holy Week services commence with Tenebrae at 18.00 on Wednesday 17th April and continue until the great celebration of the Easter Vigil at 18:00 on Saturday 20th April.